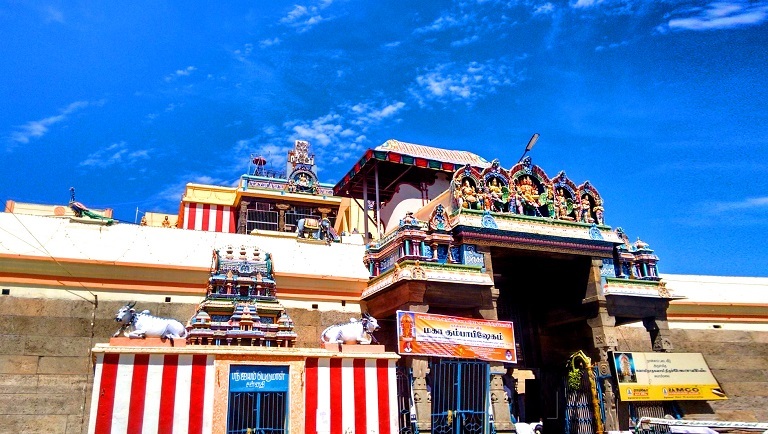 Swamimalai holds a special place in the hearts of Murugan devotees. The temple is said to have been built in early 2nd century BC by Parantaka Chola I. It is the fourth of six Aarupadaiveedu (the six most significant shrines dedicated to Murugan in Tamil Nadu) and is important because this is when and where the secret of the Pranava Mantra “Aum” was revealed. WHY: Lord Murugan, God of Tamil! The child Murugan reveals the meaning of the Pranava Mantra (Aum); Pranava means “cosmic sound” in Sanskrit. Hindus believe the whole universe is created from “Aum” and that everything has its origin in “Aum”. Swamimalai is closely linked to the story of how the meaning of this cosmic sound was revealed by Lord Murugan to his father, Lord Shiva. 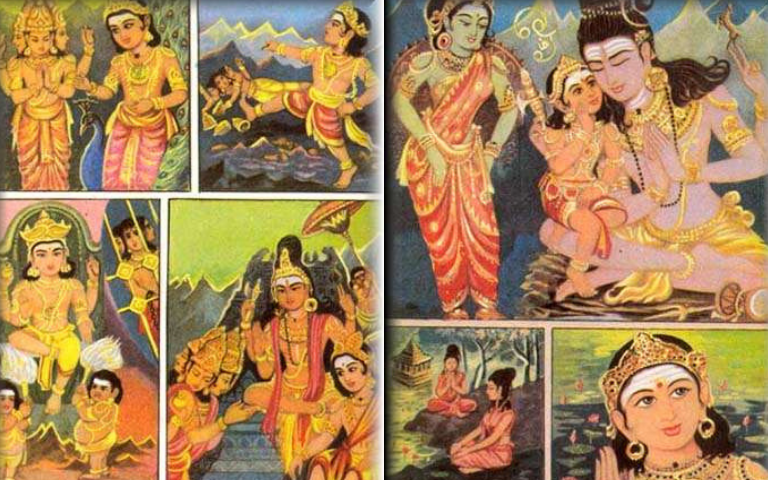 Once Brahma, the Lord of all creation, disrespected Murugan when he was visiting Mount Kailash. Then, the ever-playful Murugan boldly asked Brahma the meaning of the Pranava Mantra “AUM”. Failing to answer the question, Brahma admitted his ignorance. Murugan, knocked his forehead, and imprisoned him, bringing the whole of creation to a standstill. The demigods prayed to Lord Shiva for the release of Brahma. But Murugan insisted the imprisonment was a just punishment for Brahma ignorance. Lord Shiva then asked Murugan whether he Himself knew the meaning of Pranava “Aum”. Murugan said he knew its meaning, but would only explain it if Lord Shiva accepted him as a guru and listened to him as a devoted disciple. Shiva accepted the request, and the son became the teacher. He then imparted upon the father the meaning of the sacred Pranava mantra “Aum” and the divine father, proud of understanding the significance, conferred respect to Murugan for his wisdom. 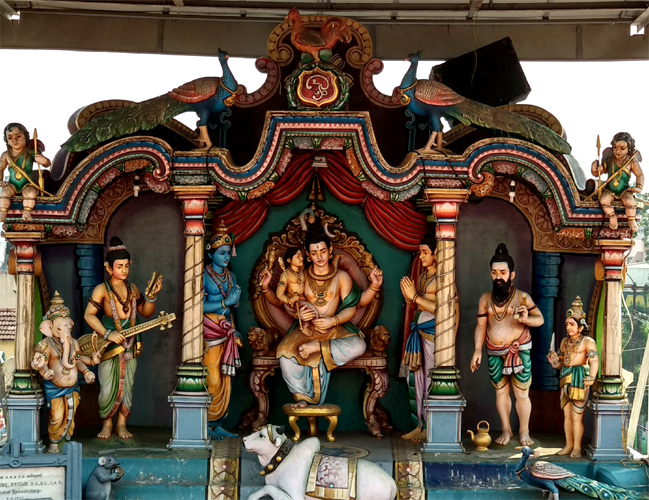 You will see in the main shrine in the temple complex in Swamimalai that Murugan is depicted as a teacher and Shiva is listening as a disciple and, in this temple, the son is on a higher pedestal than the father. The 60 steps leading to the temple on the hillock represents the sixty years of the Hindu calendar. The deity of each year is said to be praying to Murugan in the form of steps. In Swamimalai, Murugan rides an elephant as his vehicle instead of a Peacock and this is depicted in the inner sanctum of the temple. The elephant is called ‘Airavadham’ and it is a gift from the king of heavens himself, Indra, after the destruction of the demon Harikesa by Murugan. Don’t miss out the sacred tanks at Swamimalai, the Vajra Theertham, Kumara Theertham, Saravana Theertham, and Netra Theertham. These divine water sources are in and around the temple. One legend tells the story of a blind devotee called Sumathi who has lost his sight because of his sins. He then took the advice of Sage Bharadwaja and took a dip in the Netra Theertham to regain his sight. LEARN: How to Receive Lord Murugan’s Blessings? Swamimalai will always be the place for seekers of the ancient truth on the essence of the ultimate reality.